Enlisted in the USAF after Pearl Harbor and received his wings after flight training in Vernon and Waco, Texas. Flew 56 combat missions in Europe and 7 over Japan as a B-25 bomber pilot. Served as a B-25 flight instructor until leaving the USAF to enter university. 1949-1951, worked as an engineer with the Boeing Aircraft Company in Seattle. 1951, recalled to active duty with the Minnesota Air National Guard. 1955, entered the USAF Experimental Test Pilot School at Edwards AFB, California. 1956-1959, served as a test pilot at Edwards until selection by NASA. 1962, grounded by NASA flight surgeons due to an irregular heartbeat diagnosed as idiopathic atrial fibrillation. 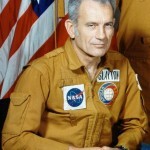 Named co-ordinator of Astronaut Activities. 1963, resigned USAF commission in November to become Director of Flight Crew Operations at the Manned Spacecraft Center, Houston, Texas. 1972, restored to active flight status. 1975, Flew his first(and only) space flight as the Docking Module Pilot on the Apollo-Soyuz Test Project, 16 years after selection as an astronaut. 1975-1977, Manager, Space Shuttle Approach and Landing Test Program. 1977-1982, Manager, Space Shuttle Orbital Test Flight Program. 1982, Retired from NASA in February(after the second Space Shuttle flight) to become President of Space Services Inc., Houston, Texas. 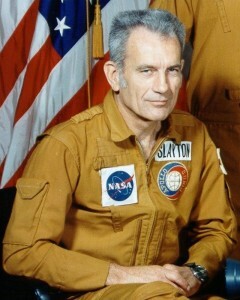 Deke Slayton died from complications of a brain tumor in League City, Texas, on June 13, 1993.